For quantitative determination of L-phenylalanine and evaluation of drug effects on its metabolism. • Sensitive and accurate. 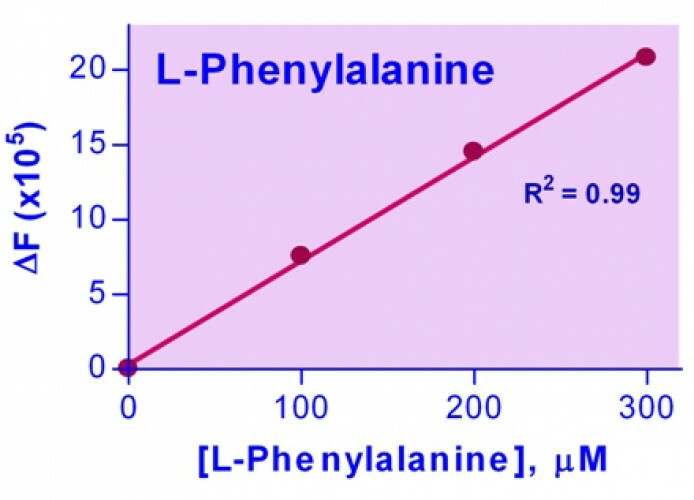 Linear detection range of 2 - 300 μM L-phenylalanine. L-Phenylalanine is one of the twenty common amino acids and an important precursor for several key signal molecules such as dopamine, norepinephrine, epinephrine, and the skin pigment melanin. It is found naturally in the breast milk of mammals, and used as nutritional supplements in food and drink products. The genetic disorder phenylketonuria is the inability to metabolize phenylalanine. Individuals with this disorder are known as "phenylketonurics". Individuals who cannot metabolize phenylalanine must monitor their intake of protein to control the buildup of phenylalanine. BioAssay Systems’ L-Phenylalanine Assay Kit provides a convenient fluorimetric means to measure L-phenylalanine in biological samples. In the assay, L-phenylalanine is oxidized by phenylalanine dehydrogenase, producing NADH, which reduces a fluorescent dye to a highly fluorescent product. 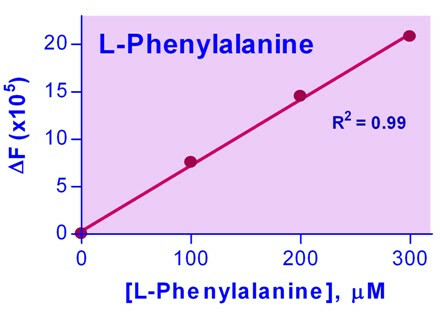 The resulting fluorescence intensity (λex/em = 530/585 nm) is linear to the L-phenylalanine concentration in the sample. Applications For quantitative determination of L-phenylalanine and evaluation of drug effects on its metabolism.